Below are standard catalog items which are kept in stock. We customize items as well. Give us a call to discuss your custom design needs. Versatile small hook mounts anywhere to hold small center-tab plastic grocery bags. Mounting screw included. If you have plastic bags this is a must have for any store! Attach sidekick to upright shelf for stability. 4" wire hook for sidekicks, power wings and crossbars. Wire grid panel great for displaying a variety of items. 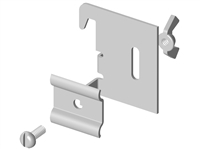 Wire scanner hook with plate for use on sidekicks. Make your Sidekick stand on its own with add on legs. Heavy duty wire freezer merchandiser basket. Merchandiser for tight traffic areas!